Includes one long pink glove & one short green glove. Perhaps the most annoying part of the 80s was Valley Speak. But, at the same time, it was fun to do. No, Duh! Our parents hated when we talked like that. And, now we understand, because when our kids talk like that, it's super annoying. They did warn us that we would get our comeuppance. But, we were young and just responded with "I'm so sure". Well, we have a pretty easy way to get your kids to stop talking like Valley girls. Beat them at their own game. You were the original Valley girl. You had the language down, and somewhere in the back of your closet are the neon shorts and baggy sweaters. Maybe even some leg warmers if you look back far enough. 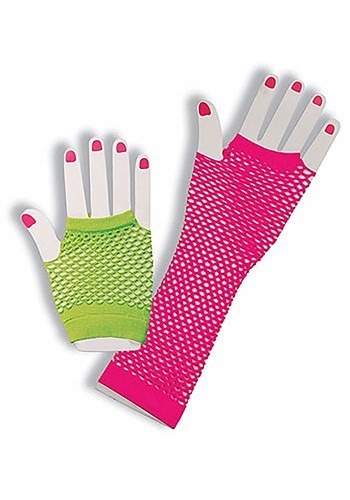 Add these Neon Fishnet Fingerless Gloves to complete the look of a totally tubular Valley girl. Trust us, they'll stop talking like new wave Valley girls.